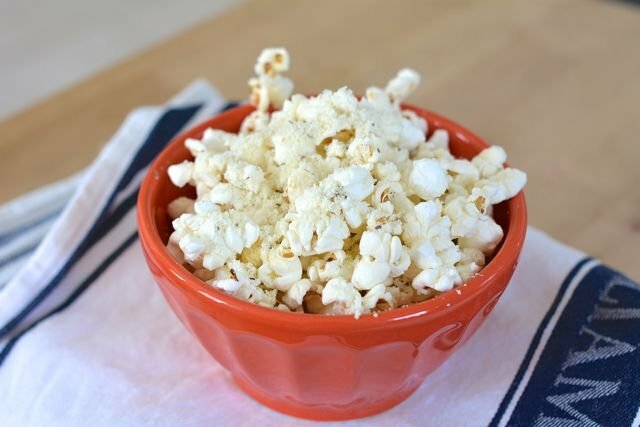 My kids love snacking on popcorn, and I love making it. It really is a simple, easy snack to make. Not to mention corn kernels are fairly inexpensive, making it an economical treat as well! My kids used to only eat it with melted butter, but lately I’ve had some luck getting them to try different flavor variations. We’ve been trying all sorts of things from the spice cabinet, and this latest variation is a real favorite. It is salty, herbaceous, and totally satisfying. It even has a light dusting of Parmesan cheese which, as any popcorn snacker understands, is simply the best popcorn topping of all time. Here is how you can pop your own beautiful bowl of herbed popcorn right now! Step 1: Cook the popcorn on the stove top according to the package directions. Step 2: Meanwhile, in a microwave-proof bowl, melt the butter and stir in the basil and garlic salt. Step 3: Transfer the fresh popcorn to a large bowl and toss it with the melted butter. Then toss in the Parmesan and serve warm.